In the below infographic, you can see this year’s top 50 Pet blogs of 2014. If you’re a pet lover then you should bookmark all of the below blogs! Click here to see last year’s top 100 pet blogs of 2013. We were happy to once again be included in the rankings and we are slowly making our way upwards! This year we came in at number 35, up from 41. The blogs on this list are great and it’s good to see many familiar blogs doing so well. You can help us do even better next year by following us on twitter and liking us on facebook to stay up to date with the latest pet news and keep track of our new posts. 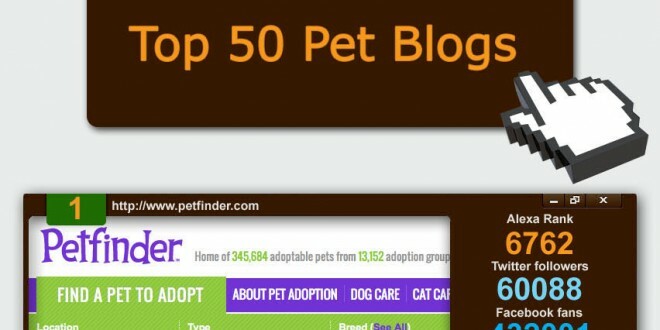 The Top 50 Pet Blogs of Next Year? Are there any pet blogs you think deserve to be included in the ‘Top 50 Pet Blogs’ for next year? Let us know in the comments below! Looks like a great list but would be so much handier if you had links to each one, or maybe my browser is playing up? Please take a look this dog blog from Watch my Chops Dog Training. Always interesting articles and clearly very knowledgable about her subject.